Make sure you’re using the right material. Did you know that there are hundreds of plastics (let alone other materials) that can be injection molded? It’s important to consider what function you want a particular piece to accomplish, and which material is most appropriate to make that happen. Does a piece need to be pliable or rigid? Will it be exposed to heat or extreme temperature deviations? How does Factor of Safety affect the materials required for design? It’s a common mistake to assume that a state-of-the-art, top-of-the-line material is the right one to utilize, but if its good qualities aren’t pertinent to your project, then they are essentially useless - and may cost more money overall. For instance, why use a 40% glass filled nylon when polyethylene would do the trick just as well? The best material for injection molding is the one that best fits your requirements and is not simply the better material overall. Identify where processes can be consolidated. There are a lot of secondary processes involved in producing a part from scratch. Such processes (like custom inserts, label printing, painting, etc.) can prove to be time consuming, as they require extensive setup – and in injection molding, time is money. All those extra costs - and the time that could have been saved with better production management - ultimately drive the part price up. The best practice is to try to combine all of these processes into one single robust process. Read more about the Creative Mechanisms process, and how we design for defect prevention in injection molding. Be selective when choosing who does the injection molding. Like most industries, the injection molding industry is full of small, mid-size, and large companies. One or the other may be more appropriate depending on your project. Smaller companies will generally offer more flexibility and lower costs, whereas prices may be driven up with large companies due to higher overhead, higher salaries, and sometimes more advanced technology. In general, it’s best to choose a company that has experience molding your type of product, as it will save time during the research and development part of the project. Remember that bigger and more expensive does not necessarily equal better quality. Creative Mechanisms is not an injection molding company, but over the years, we have built a reliable network of high quality, responsive manufacturing companies that have helped to turn ideas into reality. 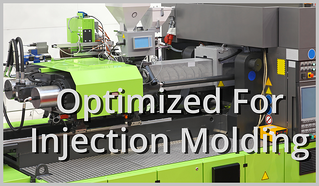 The right design and engineering company can ensure a cost effective injection molding process. From initial design, to prototyping, to the finished product, Creative Mechanisms can help turn your idea into reality with cost effective injection molding in mind. We are a design and engineering firm with experience designing products across multiple industries, and we’ve built a strategic network of injection molding companies to finish the process. Please visit our customer testimonial page to learn about the successes we have been able to pass on to clients, and please reach out if you have any questions.